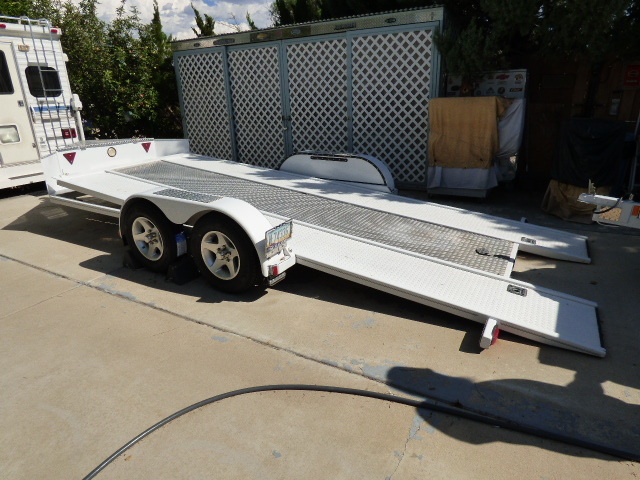 Offered for resale is an Excellent JIMGLO Custom Tilt-Bed Car Hauler with Lots of Extras. This trailer has less than 5000 Total Tow Miles on and O Miles on the New Tires, New Brake Shoes, and New Brake Cylinders. Equipped with “Surge Brakes”. It has Removable Caps on the ends of the Center Caps to Allow for Greasing of the Buddy Bearings on all 4 Wheels. Tires are 205/75 X 14 on Custom Wheels with Chrome Lug Nuts and Center Caps. There is a Full Size Spare Wheel and Tire as well. It has a Customized Carpeted Front Storage Box with a Locking Diamond Plate Lid and Full Protective Bra. Custom Repaint, Pin Striping, and Flamed Stone Guards. Added Diamond Plate Accents and Fender Step Plates. Fenders are Removable for Easy Exit and Entry of your loaded Vehicle. Quickest, simplest loading trailer ever! Simply release one lever and the bed tilts. As you drive onto the trailer the bed levels and locks into place. Secure your car and you’re done. In the words of Street Rodder Magazine, the JIMGLO “couldn’t be any easier to load”. The need for ramps is eliminated with the JIMGLO. It operates on a 2 frame system, the bed frame and the chassis frame. These frames operate in unison but separate from one another. Loading the tilt bed trailer is made easy with the extra-low ramp angle allowing clearance for the lowest of cars. Easy exit means no more climbing out your car window. Removable fenders make it easy to open your door and step out of your car. Experience effortless towing due to our revolutionary design which takes the guesswork out of finding the perfect location on your trailer in which to tie your car down. The 2 frame system distributes the weight evenly, precisely where it needs to be, creating extremely stable towing unlike any trailer you will ever experience. In the words of Street Rodder magazine when towing a ’31 roadster pickup at highway speeds, we “could barely tell it was there”. 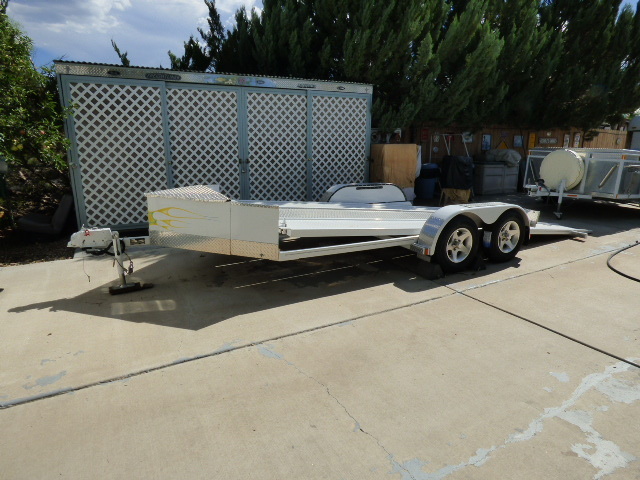 JIMGLO trailers are not easy to find for resale, particularly in such excellent condition. Don’t miss this opportunity to have your own JIMGLO Car Trailer. Selling Assistant. Private Party Sale. Offers will be Considered. Call Me and share your thoughts. Thanks for Looking.